I've written about Ohyang Manjok Jokbal before, considered by many to be among the best jokbal or pig hocks / trotters restaurants in Seoul. But in terms of history, Ohyang is really a baby compared to jokbal restaurants in the famed jokbal alley of Jangchungdong. Interestingly, the smattering of jokbal restaurants all clustered in this area all generally have a "wonjo" in their name meaning essentially, "the first". But the true original jokbal restaurant in this vicinity is the one I'm introducing today. In terms of real estate, Pyeongando Jokbaljib has a bit of a disadvantage compared to the other jokbal restaurants in this famous pig trotter area as the restaurant itself is tucked in an unassuming alley from the main Jangchundan-ro street. 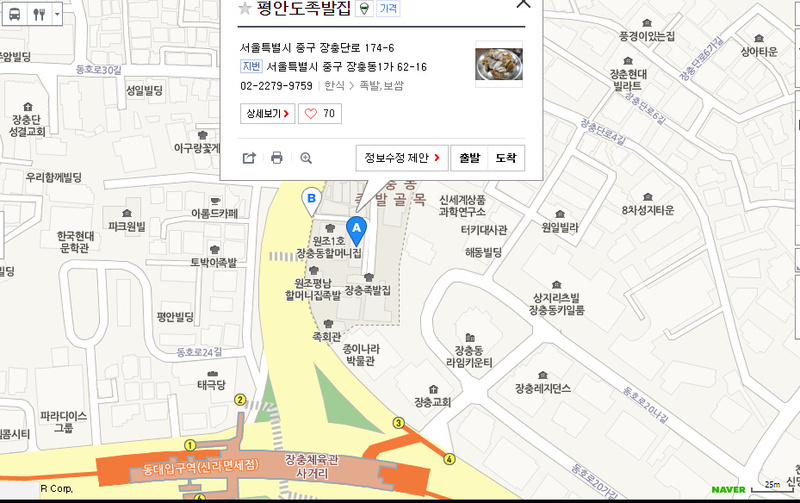 It's actually located right next to the Dddoongddoongee Halmuni Jokbal restaurant which, I've read, actually was a worker at Pyeongando Jokbaljib who opened up her own shop which now sits at the main street no less. But in terms of history, Pyeongando Jokbaljib is the grandmother of them all, having opened its doors in 1960. As the name suggests, the founding grandmother hails from the Pyeongando region of North Korea, having settled in Seoul during the Korean War. Back when she first opened, the jokbal was sold at 150 won and bindaetteok at 10 won- mere pocket change in today's rates but back then a luxury. It was especially popular with the athletes who practiced and played games at the nearby Jangchung Stadium who would come here to fill their hungry stomachs. Fast forward to today and despite its geographical disadvantage, it doesn't suffer at all as it is packed on any given night. A mixture of table and floor seating are available with the clientele being quite wide ranging from couples on dates to families. Part of its ensuing popularity through the decades owes to the fact it has been immortalized in everything from popular television shows to books and even comic books. The main jokbal is offered in four different sizes: small (for 1-2 people), medium (2-3), large (3-4) and the special/extra large (for 4-5 people). Prices are 30K, 35K, 40K, and 50K respectively. Like the other jokbal restaurants in this area, their sides are makguksu and bindaetteok for 7K each while soju and beer goes for 4K a bottle. They also have a sign saying orders for makguksu and bindaetteok are only accepted until 10PM. Basic sides are lettuce for wraps, sliced garlic, ssamjang, shrimp jeotgal, and moomuchim (radish mixture). The greens were nice and fresh, the moomuchim had a nice mixture of sweet, salty, and tart flavors while the ssamjang, I'm quite convinced, is homemade. While the offerings are essentially the same as the other jokbal restaurants in this vicinity, what's unique about this place is that they offer dongchimi or cold radish water kimchi. With a slight sweet and tart edge, this dongchimi goes down refreshingly. It's said that the dongchimi came about for the many drinkers who would come here as a second round with the dongchimi acting as not only a palate cleanser but to "wake" one up from their alcoholic buzz. I was only in a group of two and hesitated between the small and medium but, upon the server's recommendation, went with the medium which she said would ensure we (two guys) would get plenty. The serving size at any jokbal restaurant may seem enormous but underneath the slices of meat lies the immense pig bone so one should err on the side of plenty when ordering if you have a healthy appetite. In any case, the jokbal really is a sight to behold when it arrives at the table. It's almost blinding how gleaming the light reflects off the shiny collagen. Perhaps there's a reason they use pure white fluorescent light? But really, the jokbal here is visually striking as you can just observe how tender the meat is here. You can eat the jokbal slices dipped in the shrimp jeotgal or in the ssamjang on its own but the popular method of eating, as with many things in Korea, is in a ssam or wrap. Make your lettuce bed, place a slice of the jokbal dipped in the jeotgal, add some peppers or garlic if you wish as well as the moomuchim, and give just a teeny dollop of the ssamjang atop and wrap and eat in one bite. Whatever your preferred method of eating, take time to chew and explore the jokbal here and you'll find it's a masterclass in terms of cooking. To begin with, the texture is just extraordinary. The layer of collagen is melt-in-your-mouth soft yet it doesn't give an unpleasant feel or taste that makes one feel like they're chewing fat. Then you got your denser meaty part of the jokbal. With little fat, this part is easy to cook incorrectly giving it a tough and chalk-like consistency. Instead, the meat portion is superbly tender and just seeping with moisture making it ever-so-soft yet with just enough bite. In the flavors department, they've done a wonderful job eliminating gamy scents from the meat. Just enough of pork flavor to showcase the better parts of pork. I will say that personally, flavor-wise I appreciate the five spices used at Ohyang Jokbal to give it that intriguing extra dimension but the ones here are cooked without fault. After working your way through the meat, you'll uncover the huge hock bones. Any true meat enthusiast will tell you the best and flavorful meat comes just off the bones so don't be afraid to unleash your primitive instincts and pick the bone up with your hand and rip off the meat with your teeth. I hesitated on whether we should order the makguksu and the bindaetteok but honestly, there's very few reason for me to come out to this part of Seoul and I decided to make the most out of my visit. The makguksu is decent enough with a swirl of buckwheat noodles encircled by some donchimi youth and then stacked with spicy sauce, pickled radish, cucumber slices, dongchimi slush and half a hard-boiled egg. It's not very spicy and has a sweeter edge to it. It was ok, nothing particularly memorable about it but the flavors provides a good contrast to the jokbal. The bindaetteok took some time to come out, probably because they are pan fried to order. It comes on a plate served with a simple soy sauce vinaigrette on the side. Though the bindaetteok looks a bit on the thinner side, don't let the exterior fool you as within it holds bits of radish, scallions, and other ingredients. Dip into the sauce or take a piece of chopped onion, which has soaked up the vinaigrette, and add it atop your piece before biting in. With a nice creamy taste and a bit of texture from the various ingredients within, this is simple Korean goodness. While the myriad of other jokbal restaurants have gone for bolder flavors Pyeongando Jokbaljib sticks to a timeless recipe for its trotters that's devoid of any gamy smell (without masking it) and a texture that I have yet to see replicated. For newbies to jokbal these subtle differences may be hard to notice but if you're an avid jokbal fan, it's worth coming out here to taste this tried and true favorite. From exit 3 of Dongguk University Station walk straight about 100 meters along the main Jangchungdan-ro street. 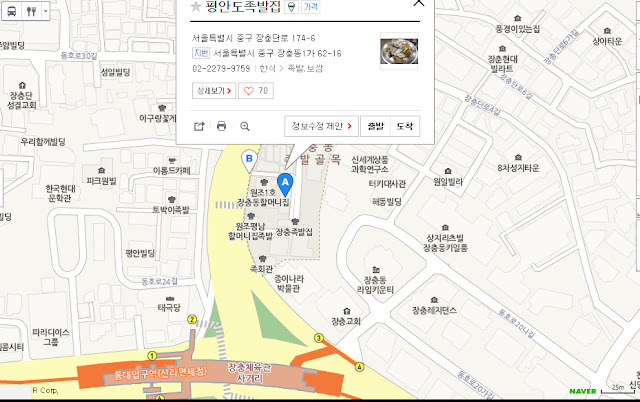 On your right you'll see a small alley that's sandwiched between two other jokbal restaurants- Ddoongddoongee Halmunijib and Wonjo 1ho Jangchungdong Halmunjijib- enter that alley and you'll see the entrance to Pyeongando Jokbaljib ahead of you. Beer, soju, and standard Korean alcohol available. Try visiting Taegukdang, one of Seoul's oldest bakeries, nearby this restaurant afterwards if you have room.